A pair of healthcare workers in the Northeast have filed lawsuits alleging that labor leaders have blocked them from resigning even after the Supreme Court ruled that mandatory public sector membership is unconstitutional. William Neely, a Pennsylvania-based psychiatric aide, has accused American Federation of State, County, and Municipal Employees Local 13 of refusing to honor his resignation. Neely was a dues paying member of the organization for 15 years before requesting to cut ties in July, shortly after the Supreme Court ruled that government agencies could no longer require paying union fees as a condition of employment. The union, according to the suit, has continued to deduct from Neely's paychecks because its contract does not honor resignation until June 2019. "Mr. Neely spoke about his resignation by telephone with various AFSCME and Council 13 officials and staff representatives who acknowledged receipt of Mr. Neely's resignation letters but told Mr. Neely that he could not resign," the suit says. When Neely reached out to his employer to cease fee payments to AFSCME he was told that payroll "could not stop the deduction of union dues from his wages without authorization from Council 13." AFSCME did not return request for comment. Connecticut nurse practitioner Cheryl Spano Lonis had a similar experience when she attempted to end her membership in Service Employees International Union District 1199 New England. Spano Lonis, a worker in the state Corrections Department, has been fighting to withdraw from SEIU since 2015 when she determined that the union's political activities were inconsistent with her religious beliefs. While labor law allows conscientious objectors to steer fees to charitable causes instead of funding the union, SEIU failed to approve her charities. Its leaders did not honor any of her resignation requests and pocketed thousands of dollars in full dues over the next three years. "Union officials treated me like an ATM," Spano Lonis said in a statement. "They ignored their own rules, violated my rights, and misused my money. I did everything I could to ensure my money wasn't used by union officials for purposes that violate my moral and religious beliefs." Both Neely and Lonis are hoping that the Supreme Court's June decision in Janus v. American Federation of State, County, and Municipal Employees will help them to finally succeed. 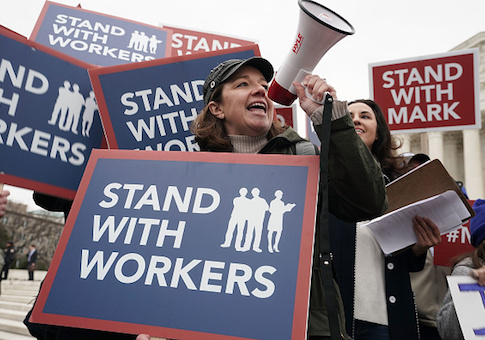 The 5-4 decision ruled that public sector employees cannot be compelled to pay union fees, overturning a four-decade precedent allowing for forced unionism. Both suits filed by the Pennsylvania-based public interest law firm Fairness Center said the courts must honor resignation requests so as not to infringe on the right to free association. "There is no state interest, compelling or otherwise, justifying the state's requirement that individuals remain members of a private organization, including a labor organization, for any length of time," the Neely suit says. Fairness Center President David Osborne said each case highlights union resistance to workers exercising their rights as employees and U.S. citizens. He told the Washington Free Beacon that Neely "did not waive his constitutional rights when he became a psychiatric aide. And his right to leave the union should not be limited to 15 days every three years." The continued paycheck deductions both plaintiffs face have forced them to subsidize organizations with which they disagree. "For three years [SEIU] has violated her constitutional rights and her fundamental beliefs," Osborne said. "Ms. Spano Lonis should be free to join and free to leave the union." Spano Lonis and Neely are both asking the courts to force the unions to repay the dues taken from their paychecks. The Fairness Center suits are just the latest legal actions that unions have faced in the wake of Janus. Labor organizations in a handful of states are now confronting class action suits seeking to recover forced dues payments taken over the years. No court has yet to approve of such a suit, but some labor organizations are working to get ahead of such judgments. In July, SEIU Local 503 agreed to pay Oregon worker Debora Nearman $3,000 in back dues—the settlement helped them to avoid a potentially-precedent setting case that could have opened unions up to future claims.